Have you ever seen deer? Remarkable animals, right? Most likely, even if you so one, you were never able to get close to it, because it ran away. Here is the question I don’t think anyone asked: Where Do Deer Sleep? I mean they have to have some kind of a spot or a nest, where they can lie down and sleep, right? Not a lot of people saw a sleeping deer, because, well, for the most part, they didn’t really care, or it was highly unlikable for them to ever witness a sleeping deer. Do they have some nests under trees? Do they live in caves? In this article, we are going to answer this question. 1) Where Do Deer Sleep? 2) Why Do They Pick Specific Spots For Their Sleep? 3) How Do Deer Sleep? 4) How Do They Survive In Times Of Sleep? 5) Has Anyone Ever Encountered A Sleeping Deer? 6) Is It Possible To Get Close To A Sleeping Deer? Deer usually pick place/places in deep forests, which can also contain broken woods lying on the ground. They can also choose a spot near an area where food is located. The can sleep alone or in groups, the latter option is much more insecure than the former. Deer also have a habit of sleeping in the same spot repeatedly. And you have to keep in mind, that even if they are in a sleeping position, that doesn’t necessarily mean that they are sleeping, – they could just be resting. So this is the answer, but you are probably wondering about why they choose such places, to begin with!? Deer are inoffensive animals. But the animal world consists of two types of animals: predators and prey. Deer are prey, so they choose a spot that would offer a good cover for them. Wild animals like tigers see deer as prey and so they hunt them, and deer are most likely to be caught by these predators even if they try to run. So they need to sleep at a safe spot, but as prey, they don’t get as much sleep as predators. 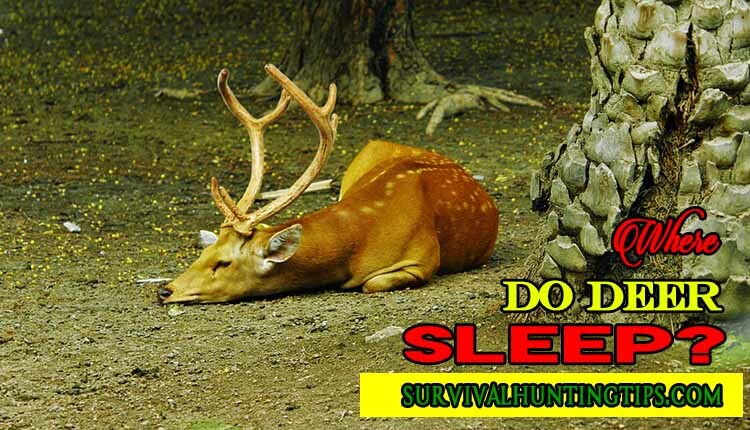 According to the Quality Deer Management Association (QDMA), because of their fears of danger deer’s version of sleep is more like dozing, where the deer will typically sleep from 30 seconds to 20 minutes. And well, like all animals, they have to eat occasionally. That’s an interesting question. How does any animal sleep in that manner? In the case of deer, they can sleep with their eyes open or closed. Their noses can be positioned under their hind legs or on their sides. Deer can also lie with their heads up. There is a variety of positions a deer can take for his sleep. A general time of their sleeping is about 10 minutes. Deer are vulnerable animals, especially when they sleep, but thanks to their constantly swiveling ears, they are able to detect what is happening around them. The slightest noise can trigger them, causing them to bolt their head and look for the source of such noise. They keep looking and if they don’t spot any dangerous animal, they continue to rest. As a matter of fact, some people did. They even post videos on YouTube of one or multiple sleeping deer. For example, some has encountered a matured deer that has been sleeping before waking up. This deer has been sleeping with his head up and eyes closed. When it spotted the cameraman, it immediately ran away. It could be possible that this deer saw the cameraman as a predator. However, when it witnessed that the cameraman didn’t try t run after him, it stopped. Well, it depends. You should expect a deer to continue sleeping while you crawl towards it. And even if get close, the deer can still wake up, and in close proximity, it can accidentally hurt you with its toes. There were a lot of accidents where some forest travelers accidentally got close to sleeping deer without even noticing them, and some of those travelers got hurt but these deer. So even though they are inoffensive, they instincts play a key role in their survival, and so they can hurt someone, though not my intention. In conclusion, I must add that I adore deer like I adore most of the inoffensive and cute animals, and I’ve always wanted to look at one in a close distance but never did. These animals are especially adorable when they sleep, so if you encounter one, make sure to take video of him!